It’s been the cruelest of winters in southern New England. 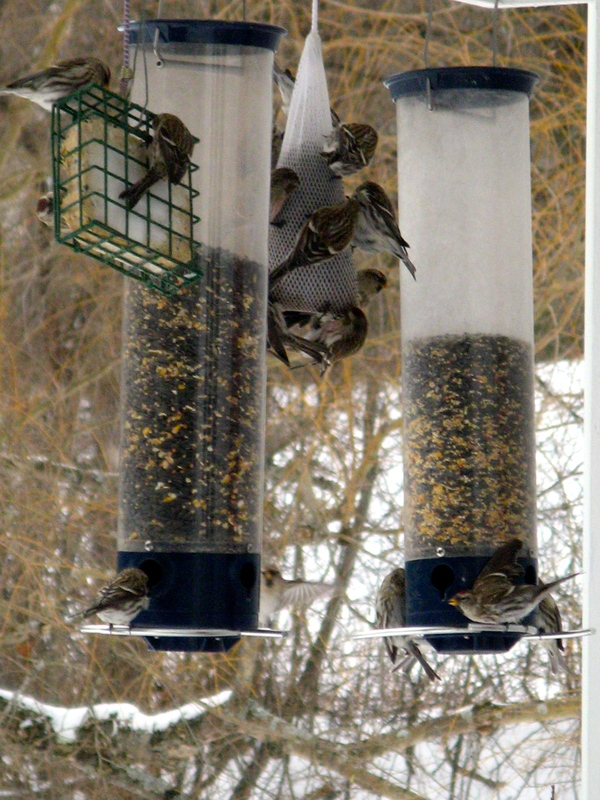 The birds have been swarming the feeders and suet cages, and the squirrels, driven to suicidal measures to crack what had been our fool-proof Yankee bird feeder, took to digging their back claws into the porch screens, launching their bodies forth like trapeze artists, and hungrily scrabbling in a mouthful or two of seed before gravity brought them thumping back to earth. It was a sad, discouraging sight, though I couldn’t help but sympathize with their sense of desperation. It’s March for heaven’s sakes— but the snow keeps on coming and the morning temperatures still hover routinely in the teens. I’m not sure how you’ve made it through this bitter, blustery period, but two things have helped me — and both involve making beds. Vegetable beds, that is. A couple of months ago the seed catalogs began to arrive. For those of us who garden, these glossy four-color brochures are more enticing and dream-inducing than anything Saks or Bloomingdale’s has to offer. Cuban Yellow Grape cherry tomatoes! Succulent Deer Tongue Bibb lettuce! Neopolitan Pole Beans! Ariane orange peppers that ripen in 65 days! I drooled over the sun-drenched photos of dangling eggplant and climbing peas, the neat, bright rows of rainbow chard, the hillocks of flowering nasturiums. 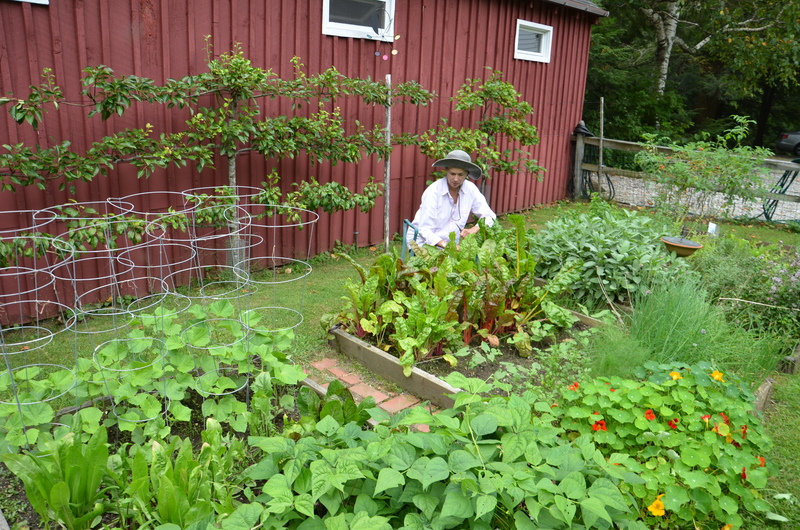 Our primary growing season in the Berkshires is a little over three months long. My fenced-in vegetable garden has eight raised beds, each about the size of a twin mattress. But I usually find myself buying enough seeds to keep a full-sized farm supplied for a couple of seasons. 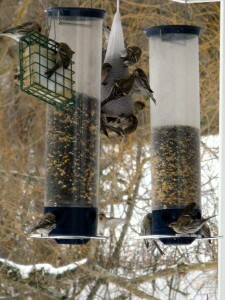 At $5.00 or so a packet, I can’t think of an easier, more productive way to stare down winter’s hoary gaze — and win. It must be some primordial yearning — a harking back to our Neanderthal beginnings — but there’s something about these long, dark days that makes me want to roast things. I’ve done my share of stews and daubes, but I still find nothing more satisfying than a simple whole roasted chicken. And, if you set your bird down on a bed of vegetables and pop the casserole in the oven for an hour or two, you’ve got a remarkably easy single-dish meal that’s worthy of a dinner party. A few Thanksgivings ago, my oldest brother and his wife put together a fantastic medley of fruit, herbs, and vegetables as a sidedish for the turkey, I’ve been experimenting with new combinations of vegetable beds for roast chicken. Root vegetables are particularly delicious roasted this way, tending to carmelize and deepen in flavor after mingling with the pan juices. Turnips, B-sized potatoes, and carrots are terrific together — and sensational when served with sauteed string beans and mushrooms. Another winning medley is brussels sprouts, chestnuts, and shallots which, if you feel like upping the ante, are terrific tossed with slab bacon strips and pomegranate seeds. 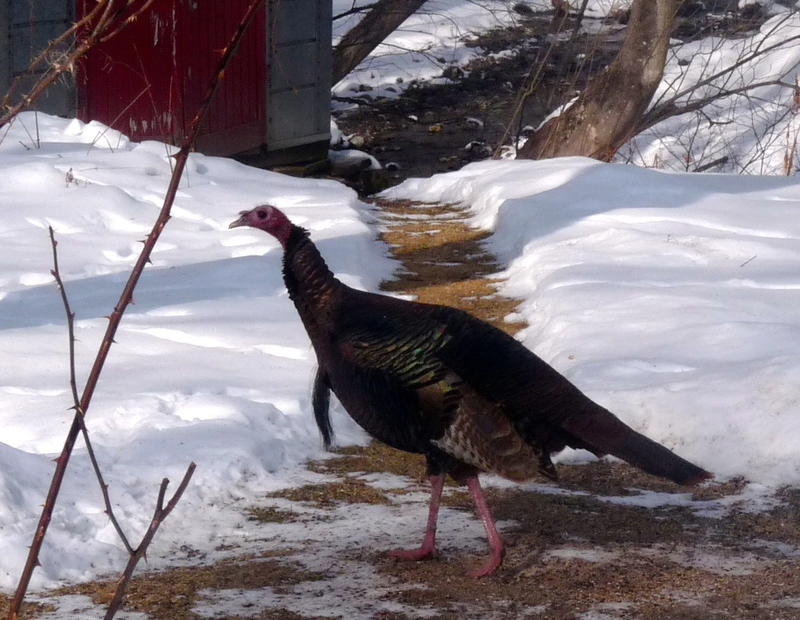 Last month a handsome, male turkey visited our habitat looking for food. After a few tussles with the resident crows, guarding their turf, he joined our family of birds, squirrels, and the occasional chipmunk emerging from his den, to eat corn, seed, fruit and berry. We named him Alexander. During the day he would eat his fill, then follow the arc of the sun to the brook for a drink and relaxation in the light on the hillside. At dusk, he would walk across our road to the woods to roost. One evening as we were watching him depart, we were amazed to see him sprinting down the road, like an airplane taxiing on a runway, then lift up to roost in a large tree 50 feet above our driveway. He stayed all night. It was a magical sight to look out the window in the pitch black to see his silhouette amongst the stars. He is gone now, probably looking for a mate. We miss him. His presence was a gift during this long hard winter, and the birdseed and sanctuary was our gift to him for strength and survival. Hope he stops by with his harem!! News flash on March 31st! Alexander has returned!!! We are so happy to see him again, and are glued to the window each day. He is looking good and very manly. We are still surprised that he remains a loner, especially now when other turkeys are grouping up and finding mates. Maybe he is a poet and likes to be by himself mulling over the trials and joys of his life. He is definitely wilder after spending the last two months on Harvey Mountain, but is enjoying feasting — he has started to jump on top of the table we spread feed on and greedly eat his fill. 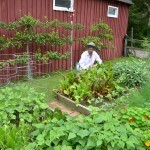 Start creating vegetable beds of your own— either kind — and let me know what you come up with! Send me photos and add your thoughts and advice below. Those catalogs have such colorful pictures of vegetables and fruits we used them to cut up for valentines when my daughter was young. The rose catalogs made especially good illustrations to decorate your loving message. What a wonderful idea, Patty. I wish I had one of those valentines now! We too feel so fortunate to have these beautiful creatures around us during this extreme winter. 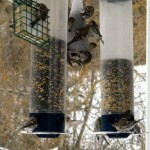 We are rewarded daily with their song and color. 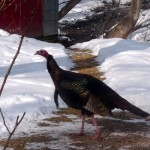 Last month a handsome, male turkey visited our habitat looking for food. After a few tussles with the resident crows, guarding their turf, he joined our family of birds, squirrels, and occasional chipmunk emerging from his den, to eat corn, seed, fruit and berry.